Hadn't done one of these since about 1977, but I did a CB install on my 2000 Ford Ranger Friday night. 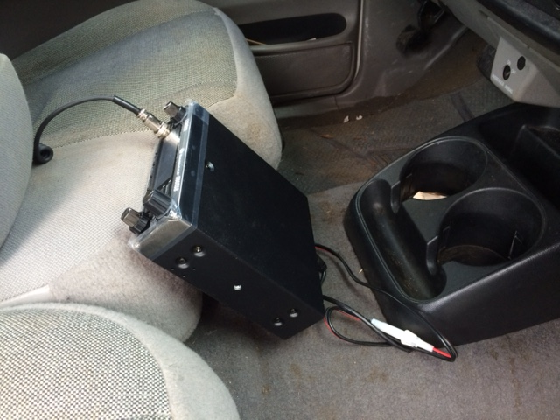 I actually have a two meter transceiver I was going to put in the Ranger, but got an itch to do a CB install first. I put the antenna on the tool box even though half the world says that's a no-no. An aluminum truck mirror mount worked well on the box. The second half clamp is inside the box. 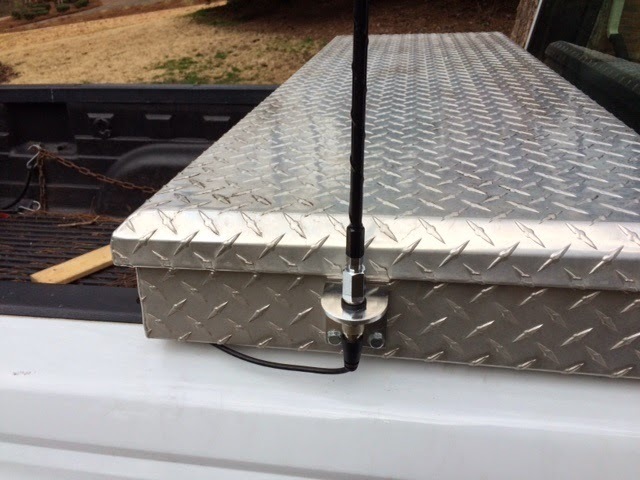 Because tool boxes are notorious for being poorly grounded (thus the naysayers), I went ahead and and ran two grounding straps from the antenna mount down to the metal bed ties covered by the box. Antenna cable got routed under the box, then out over the front of the bed, and down into a structural column on the bed's front left. 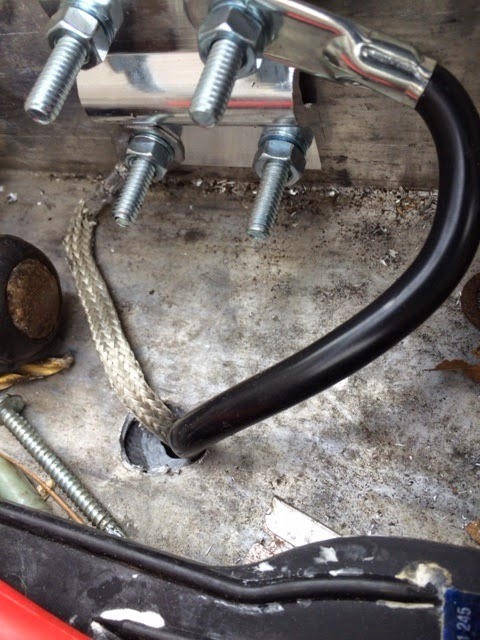 I made a couple of loops in good places where the cable could be secured, then it was over to the bottom of the cab, and up through the bottom of the rear passenger side door. Squeezed the R58 cable under the floor door trim (without remova)l then up under the glove box area to complete the run to the cab front center. Eighteen feet of cable made for a nice run, just a wee bit to spare. Got nearly flat SWR readings using an '80s era original Cobra 19 after initial antenna adjustments. But a newer Uniden 980SSB shows in the range of 1 to 1.5 on both its internal meter and the Radio Shack external one I used with the Cobra. For now, the Uniden's sitting on the truck floor which puts controls within easy reach of the driver. My thinking is to fashion a verticle rack with some scrap angle iron, something I can pick up and move to the minivan I sometimes drive. I'm thinking that two meter radio I have can piggyback on rack as well when the comms accessorizing gets to the next phase. And I sort of cheated getting power to this rig. I have one of those Ford trucks where the cigarette lighter clip on the dash bezel broke years ago. So took the bezel loose, fished out the lighter and wires, and repurposed the circuit for CB, splicing in just behind the bezel. I also found a round switch at an auto parts store that fits in the old lighter hole, giving me a power kill switch and an LED light that glows when power's on to the radio. 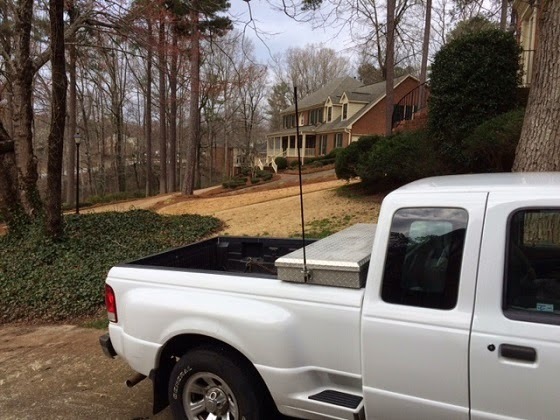 I'd planned to pick up a junker CB AM/SSB radio for the truck, and I still might. But I'm really liking the Uniden, which I originally intended as a base. The 980SSB has a channel scan function I really like. Going back to click, click, click manual scanning might be tough to do. I want to work a few more contacts and spend more time with the Uniden before doing a more thorough review. For two meters, I'll have to run DC power straight from the battery. More of a chore than I want to bite into right now.